Each year the casinos improve their guard technologies and make their slots more secure. You may google Tommy Glenn Carmichael bio who is considered to be the most successful person among the slot machine cheats. He has introduced the Monkey's Paw which is a trigger for slots payout mechanism actually. As a result he went to a jail and casinos created a shield against this technique. Nowadays Tommy Glenn Carmichael works for gambling industry and creates anti-cheating devices. One of the most successful ways to cheat at slots is to use mini-light. This special device lights at the slots sensors and confuse the coins count. This technique worked for a while but nowadays the machines are protected from mini-light influence. Switch over to more rudimentary slot machine cheats. 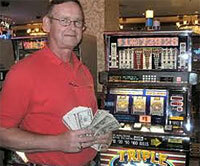 Thus a player who wants to win at slot machines more may use counterfeit coins (the notion slugging is also used). This method may work from time to time but still - the nowadays technologies work miracles. Also we may consider the coin-on-a-string technique as a kind of old-school slot machine cheats. And we sure you know the answer already - casinos introduces the counter measures and this technique sinks into oblivion. In fact, the club cards are likely to be used in modern casinos to control your bankroll and exclude cheating. Being a sophisticated slot player with some acting talents, you may perform the next drama story on gambling house stage directly. As the machine screen shows the jackpot has been paid caption (and the slots may malfunction) + you are so convincingly playing your role - there is a chance for you to fool the casino. If only casino cameras won't notice your Hollywood-style performance.